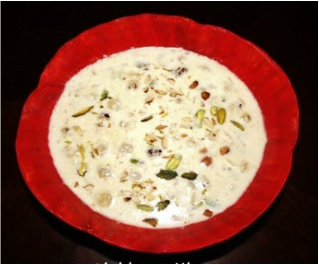 Makhana kheer is an unusual desert generally prepared during Navaratri fast and krishan janmashtami. 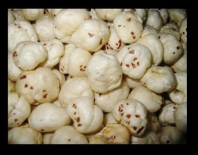 It is made by Makhana, milk, sugar and nuts. 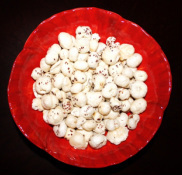 First makhana are chopped then they are sautéed with butter or ghee then they are cooked in milk on low heat till milk is thick and creamy, then they are garnish with almonds and pistachios. 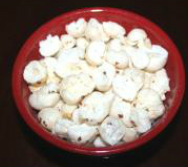 ​Northern India Makhana are often used for snack. 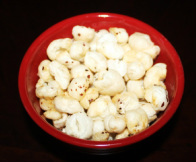 They are either sautéed in ghee or fried then spices are sprinkled on them then they are served as tea time snack. 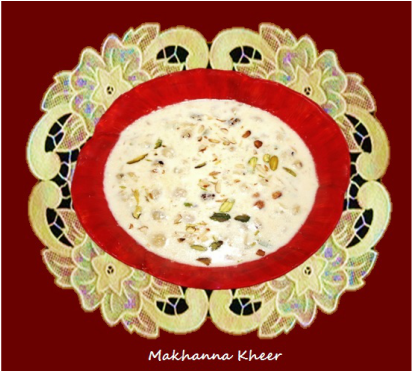 Makhana kheer is very easy to make and you can enjoy it anytime you like having it. fine). With a scissor cut makhanas into halves. 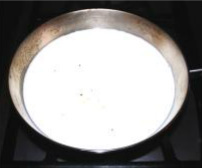 stirring periodically so that milk does not burn from the bottom. 4. 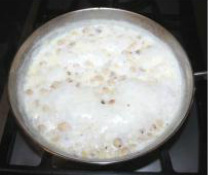 Once milk start boiling turn the heat down and let it boil about 20 to 25 while keep stirring and scraping the side of the pan periodically so that milk and side of the pan do not burn from the bottom and the sides. 5. 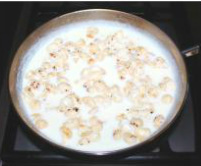 Once milk become little thicker add sautéed makhanna and let the makhanas and milk simmer for 20 to 25 minutes on low heat or until milk reduce to half and of acreamy consistency, stirring frequently. 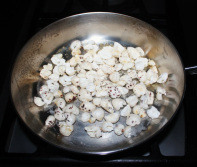 and half of the nuts, mix and cook for another 5 minutes. 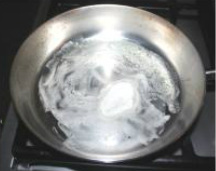 Turn the stove off. 7. 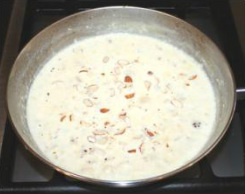 Transfer the kheer in a serving bowl and sprinkle other half of nuts. 8. 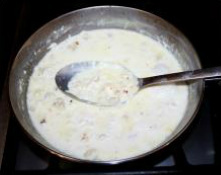 Serve the makhana kheer hot or cold.